Adam Kovac (@AdamJKovac) is a freelance journalist based in Montreal. On January 20, 2017, Rabbi Marvin Hier solemnly stepped to the podium outside the Capitol building in Washington and addressed an audience of millions. Behind him was Barack Obama. To his right, a stoic Donald Trump, who, in a few short minutes, would take the oath and become the forty-fifth president of the United States. The rise of extreme movements rarely spells good things for the tribes of Israel. Trump might never build his border wall or bring back coal-mining jobs or even avoid impeachment, but his presidency has already led to at least one miracle: he’s gotten white nationalists (some of whom have adopted the words, symbols, and ideas of the Third Reich) and an increasingly conservative faction of Jews to agree—at least when it comes to the greatness of Donald J. Trump. As other right-wing nationalist movements gain momentum in the United Kingdom, France, Poland, and Hungary, these kinds of unlikely partnerships will keep cropping up. But as history has repeatedly shown, when politics become more populist, some people find themselves on the outside looking in. The Muslim community is currently facing the harshest scrutiny and violence. But studying Judaic history tends to breed paranoia: the rise of extreme movements rarely spells good things for the tribes of Israel. The question isn’t whether this big tent that houses Jews and the alt-right will collapse—it’s how bad the damage will be for Jews, and our democratic institutions, when it inevitably does. As CNN broadcasts Trump’s inauguration, Beryl Wajsman offers running commentary from the smoky confines of the cigar room in Chez Alexandre, a regal restaurant in downtown Montreal. With his grey stubble, black jacket, black shirt, and black boots, Wajsman has the appearance of a punk-rock rabbi (although the non-kosher chicken wings in front of him put to rest any notion of Orthodox piety). On the Canadian side of the border, more and more Jews have found the left failing that test. Stephen Harper’s unwavering support for Israel attracted many Jews to the Conservative Party—an Ipsos exit poll during the 2011 election noted that the Tories received 52 percent of the votes cast by Jews (no data is available for the 2015 election). In the US, though, the shift right has not been as prevalent: a post-election Pew poll showed that roughly 70 percent of Jews voted for Hillary Clinton. But many Canadians—and conservative American Jews—monitoring the race saw something they found troubling: in the final days of the Obama presidency, the US declined to veto a United Nations Security Council resolution condemning Israel and freed up $221 million in aid money for the Palestinians. For many, this was a confirmation that just as Canadian Liberals had abandoned Israel, so, too, had the American Democrats. 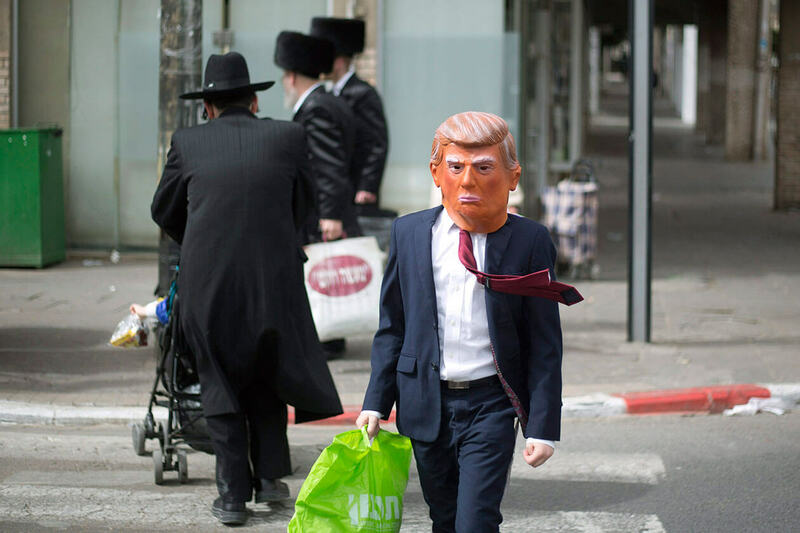 From the perspective of these conservative, ardently Zionist Jews, Trump is set to become the best friend Israel has ever had in the Oval Office. They see a man with a Jewish daughter and son-in-law who will guide him toward pro-Israel policies, such as giving that government a pass on building and maintaining settlements in the West Bank. But another group of Americans look at Trump and see something completely different. Some who identify as alt-right see Trump as a defender of a white homeland, a leader who, through stringent immigration regulations and mass deportations, will bring a return to America’s more homogeneous heyday. This group is paranoid about the spread of sharia law and the dilution of ethno-European culture. It should be noted that at the end of the movie, the bus blows up. Of course, these are notions rejected by most Jews, here and abroad. As Wajsman points out, Jewish families and synagogue communities across Canada—who remember the trauma of being turned away from these shores during the Holocaust—have sponsored Syrian refugees. Still, for those Jews who are cheering on the immigration policies of Trump (and Leitch, and Le Pen, and Wilders), multicultural values are taking a back seat to what they see as pragmatism. For those squeamish about being on the same side as alt-right nationalists who, historically, have had little love for Semites, there are few options: leave the fold in protest, grudgingly accept the “big tent,” or simply downplay the threat that the alt-right poses. But ignoring the white nationalists in the room is getting more difficult. Online, many alt-right leaders and their followers have no qualms about sharing their true feelings about Jews. Richard Spencer has become a household name because of his racist and anti-Semitic stances. Lesser-known icons include Tim Treadstone, who, under the Twitter name Baked Alaska, has often posted about the “Jewish Question”—or JQ—to his 150,000 followers, referencing Jewish control of the media and allusions to gas chambers. Anti-Semitic words and threats that first surfaced on the internet are now appearing on our streets. Since Trump’s inauguration, more than fifty Jewish community centres and schools in the US have received bomb threats (a number of these have since been traced to an Israeli teenager). In Canada, threats have been made against a Jewish school in Vancouver and a community centre in Toronto. Jewish residents in Toronto have also reported swastikas and anti-Jewish notes posted on their homes. And, of course, it must be noted that violence is not just affecting Jews. Muslims around the world are facing both bigotry and violent attacks—the alleged shooter at a Quebec City mosque that left six people dead in February is an avowed Trump and Le Pen supporter. It’s now been more than four months since the election, and that hasn’t happened. Instead, the president has engaged in a war of words with the Anne Frank Center over omitting Jews from a statement regarding International Holocaust Remembrance Day; told an Orthodox Jewish reporter asking about anti-Semitism to “sit down”; and, while standing next to Israeli prime minister Benjamin Netanyahu, dodged questions about anti-Jewish attacks by boasting about his electoral-college victory. The president did finally use his joint address to Congress to denounce hatred and the desecration of Jewish cemeteries in St. Louis and Philadelphia. Still, he offered no concrete plan to fight this problem. Trump has also failed to speak publicly about the Quebec City mosque attack, or to combat the violence and hate that Muslims face in the US. He has, however, instructed a federal anti-terrorism force to focus exclusively on attacks by Muslims. What does this all mean for the Jews? Can a Bannon and a Kushner find common ground? Will the Spencers and the Hiers of the world break bread? Wajsman refers me to Leslie Epstein’s novel King of the Jews, which follows a judenrat, or Jew who served as a go-between for his community and the Nazis during the Holocaust. In other words, these types of alliances are not without precedent. The comparison isn’t perfect—the Holocaust would have been just as bloody without the co-operation of administrative councils of Jews—but there’s truth at its core. For now, there might be common cause between the two groups. But whenever extremism arises, there’s little doubt that pogroms and persecution will follow. I ask Wajsman if he thinks that kind of disaster is inevitable. His tone becomes that of the exasperated Hebrew-school teacher (paranoia might be a Jewish trait; making predictions, not so much). The world has always been dangerous for the Jews, and politics does make for strange bedfellows. But we must be careful who we’re shluffing with. You don’t want to wake up and find out your ally is out to schtupp you next.